Trevor Thorold will give an illustrated talk on Valkenberg, both the “Manor House” and the Psychiatric Hospital. Trevor Thorold, our speaker, is a long-standing member of the Vernacs and a well-known and highly-respected Cape Town-based conservation architect, who has worked on a number of significant restoration projects in Cape Town and environs. Trevor practices in collaboration with his wife, Jacqui in the practice Thorold Architects. His many projects include Waterhof, Leeuwenhof, Rust-en-Vreugd and the extensive work carried out at Solms-Delta, as well as a number of projects for UCT including Wolmunster in Rosebank which the Vernacs visited some years ago. In 1661 an allocation of 25 morgen was made by Commander Jan van Riebeeck ‘lying between Table and False Bays’ to Willem Willemz van Deventer and Pieter de Jongh. It became the nucleus of the farm on the Liesbeek River that was later called Valkenburg. 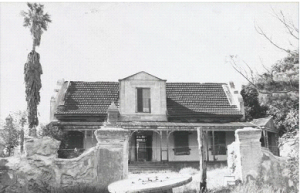 As Andre Pretorius pointed out, “Together with Coornhoop, Bloemendal and Vredenburg it has one of the oldest remaining free burgher houses on an agricultural holding, dating from the time of van Riebeeck”. In 1666 13 morgen of the grant was acquired by Willem Schalk van der Merwe, the progenitor of this well known family. 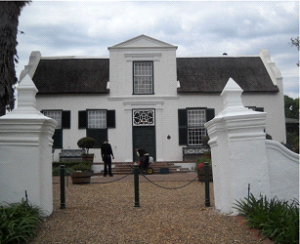 Pretorius attributes the present house to Cornelis de Waal who owned the farm from 1746 until his death in 1774. The next owner, J.M. Buyk is believed to have built the double storey wing with a wavy parapet. In 1808 it was acquired by Cornelis Mostert who is said to have built the west-facing house as it appears today. This is believed to have incorporated two adjacent buildings which lead to the off-centre gable and the lack of a voorhuis. In 1891 the Mental Hospital was established on the grounds of Valkenburg and the house became the residence of the hospital Superintendent. Years of neglect later followed as well as a fire in 1955 which resulted in the loss of many outbuildings. The house deteriorated badly and the west gable collapsed in 1985, resulting in its rebuilding. 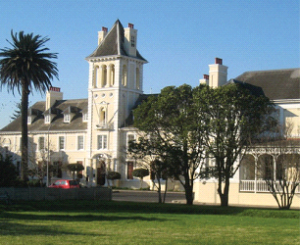 Thorold Architects have been responsible for restoration and conservation work at Valkenburg house as well as the psychiatric hospital which has been restored to its former glory.